This tool should work with all new blackberrys, just leave a comment if you find it useful and works with your blackberry. 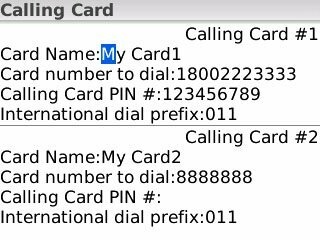 a new option will appear named "Calling Card"
You can have upto 2 calling cards setup for your blackberry, enter calling card name followed by the calling card toll free number or local number as per your requirement, if you need to enter the PIN then enter it in the following field (or leave it blank if not required), finally the international dialing access code. If there are multiple phone numbers, you will be asked to choose one. Thanks for this Titas! Very useful and works on my 8830. Can you modify it to use Google Voice? Does this work with a cellular callback service. Titas, thanks for the great app! There are two things I would like to see it do, if possible: (1) the option to dial the pound/hash sign (#) after the contact's number is dialed (preferably as an option in the configuration of the calling card, so it will do it automatically) and (2) the option to have it just dial the contact's number, rather than prompt you to have it dial (maybe with a pause command instead of a wait command). Suchin, you can already use Google Voice, with the exception that you have to hit the # sign manually (hence my above comment to Titas). 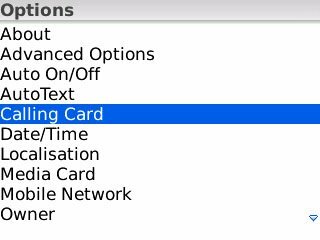 In the calling card number field, enter a lower-case 'b' for the pause, then your PIN, then another 'b', then 2. When you enter the 'b' it will show as a P in a circle (for pause). You can also use a lower-case L ('l') for Wait, instead of pause. Then it will prompt you instead of continuing automatically after the pause. Thanks Richard for your comments, in fact I did realize that I need the # option after I deployed this version, I did not go for a pause option because sometimes you really dont know how long will it take for the voice prompt to come up, may be I can give that as an option, actually I did receive lots of comments for improvement, just that I am too lazy to fix it. But I do have it in my mind maybe when I am in a good mood I may do it so check back for any updates. Hey, Great app. Thank you. The ability to dial without having to hit the again would be great, if you can get to it! i get a fatal error when installing ota or by bb desktop, what could be the cause? it would be very useful for me, especially with the hash button post dial implemented as Richard supposed. In all seriousness, for the pause option I was referring to, yes, I think that would be good to have as optional through the setup, because some calling cards work differently than others (consistency of timing, etc.). So far Google Voice seems to be pretty consistent with the timing. Would you be prepared to make the source code available? Hey Great App. BTW is this availble for iphone also? 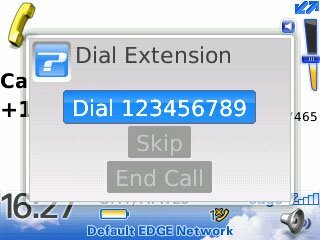 Installed on BB OS 5 and works great. Thanks. Titas, do you own the source code of this program? I would like to build on it. I'll be using the BlaCaDa 19 free dialer until you have it's "Final number sequence" for pressing the # for google voice. The free version works for 19 calls, unless you do the battery pull feature. The pro version works contextually. (eg: anywhere there is a phone number detected by the blackberry). Although any user can just press the pound key. great software, works even better than paid app. thank u so much! I will try to post the source code, very busy lately, anybody willing to improve it is most welcome. This is a great app. Works fine on the storm 2. You would qualify as a freelance genius if you could get the # key to work for all numbers as most calling cards require it (or the * ). Good job, but could be great. We await. I have posted the source code since I am not longer updating or supporting it, the application need lot of improvements as I can see from the comments, you are most welome to improve on it and if you do I would appreciate if you could include my name or a link back for the credits. This brand has everything very specific. 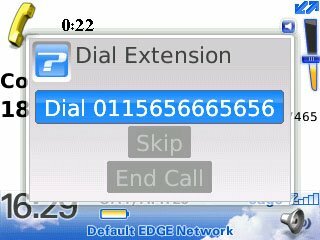 thank you very much.. your software is awesome.. i used it with Vonage free extension on my blackberry.. I downloaded the source and modified it to Wait instead of Pause, however it says I need a key to use secure API's?? Any idea how to get around this? You will have to register with Blackberry and pay to get the keys. 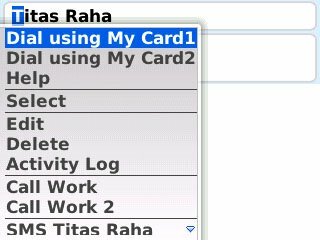 Thanks Titas, it's so handy and make it so easy to use dialing cards. Nice app for Calling Card. Copyright 2018 Titas Raha All rights reserved.